It's not a myth that weight loss gets harder as you get older. Women who have children later in life might have a harder time shedding the pregnancy weight. However, even people trying to lose just a few pounds will have a harder time at 40 years of age than they did at 20. As the body changes, so too should your weight loss system. As you age, your metabolism slows down due to a number of reasons. One reason is the loss of muscle. According to a 2010 article in "Woman’s Day" magazine, you lose 1/2 lb. of muscle every year after you reach 30. Muscle keeps your metabolism revved up, so as you lose it, your metabolism will slow down. The only way to prevent muscle loss is to do regular weight training, two to three times a week. If you’ve been yo-yo dieting your whole life, you have changed your body composition. When you crash diet, you’re more to lose muscle, rather than fat. When you go off the diet, you’re likely to regain the weight, but the weight will come back in the form of fat, not muscle. So in the end, you end up weighing the same but with a higher percentage of fat. Fat is much harder to lose than muscle or water weight. This means the next time you try to lose weight, it will be harder than the time before. Imagine you do this for 20 years or more, with weight loss getting harder every time. 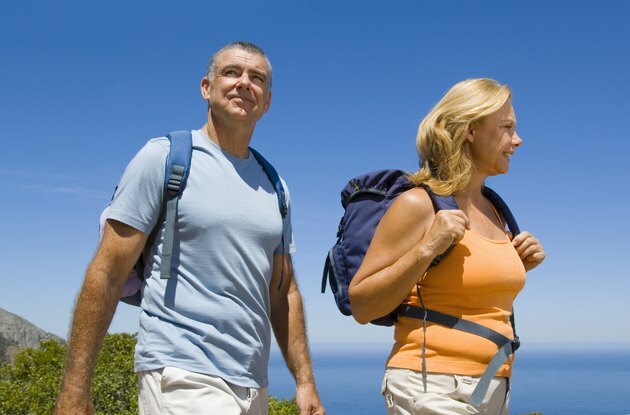 As you get older, your level of physical activity might decrease. Add to that the fact that your metabolism is slowing down and you have a problem. Unless you change the amount of calories you consume to adjust to that, you might find yourself gaining weight, or at least having a hard time losing weight. According to registered dietitian Bonnie Taub-Dix, from the American Dietetic Association, reducing just 100 calories could help you maintain your current weight. Your stress levels increase as you get older. The pressures of a career, along with the pressures of running a household, can easily build up. Experts such as naturopathic physician Laurie Steelsmith believe that this added stress can make it harder to lose weight. When your body is under stress, it releases cortisol, a hormone meant to help increase your reaction time and keep you safe. Since most of the stress you experience in life is not the “life-or-death” kind, your body ends up not using that cortisol. The hormone is then stored as fat in your body. If you find a way to control stress, the numbers on the scale might start to budge. Can a Person Lose Inches & Gain Weight?